This ca. 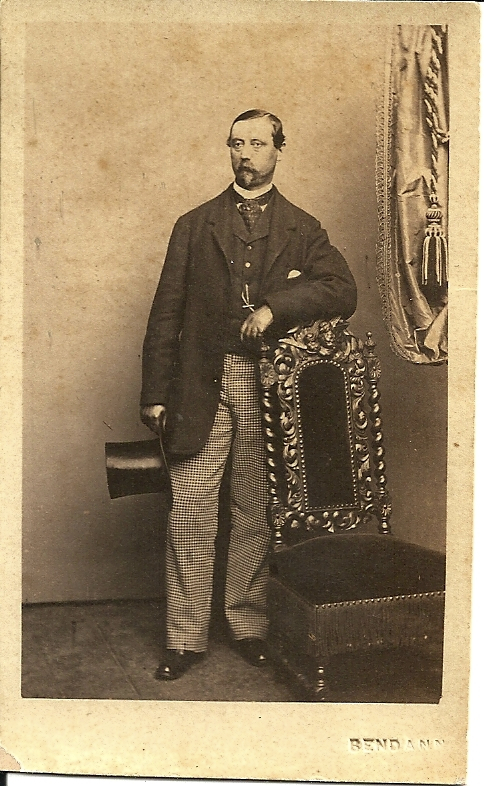 1860 carte de visite has an unusual blind-embossed “Bendann” mark instead of the usual printed studio mark. According to Baltimore photography historian Ross Kelbaugh, Daniel Bendann opened his own studio in Richmond, Virginia in 1856. In 1858, he worked as a photographer for the B & O Railroad. He and his brother, David Bendann, opened their Baltimore studio in 1859. I have one other Baltimore card photograph with a blind-emboss studio mark: A carte de visite by Henry Pollock. Blind-emboss may be an indication of an earlier date in the wet plate era. Like some earlier cartes in my collection, including the Pollock, this Bendann cdv was made with austere props on a thin, ivory card stock without border lines. His coat is shorter and more fitted than the the typical sack coat of the 1860s. He wears a matching vest and contrasting checked trousers. His necktie is worn vertically, in a soft knot at the neck–a style that seems to have been common in the 1870s. Without additional information about how the Bendanns marked their early work and when the blind emboss mark was in use, is not possible to be sure when this carte was produced. Is the image on this photograph printed directly on the card stock or attached like most other CDVs? Thanks for reading my blog . . . It is, like other cdvs, attached to card stock.